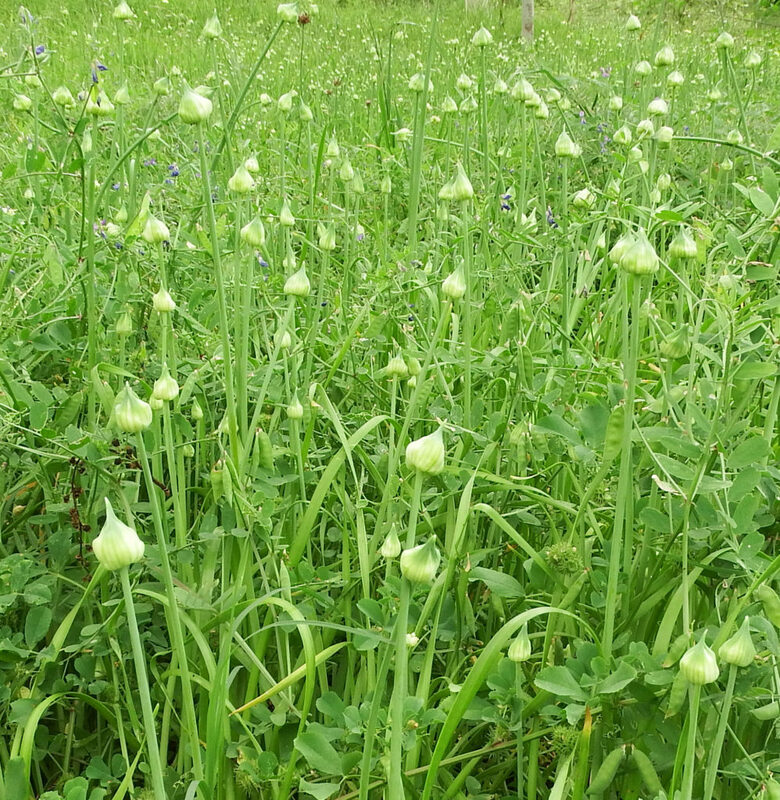 The Park is full of wild onions. All of Houston is full of them. They are visually intriguing, but I didn’t think they were interesting enough to write about. This is an onion. Story told. So I didn’t do much more than enjoy how they bite back sharply when you nibble them. But this week, the story got weird. Wild onions emerge in early spring, sending up slender leaves directly from the ground. Then, they produce a bulging flower head, ensconced in a demure covering. As I rambled the Park, I would stop and admire them, wondering what was hidden by that enticing wrapper. Curiosity got the better of me and I unwrapped a few. Inside were puzzling pearls that looked like unripened seeds. But you don’t magically get seeds without some sort of flower. There are plants whose flowers are so insignificant you fail to see them (ragweed), and plants whose flowers are inside out (figs). But these onions were up to something I couldn’t explain. Then, I got interested in other things and forgot about the onions for weeks until two mistaken assumptions left me without a topic for this blog. Those mistakes will be discussed below. But with no topic and getting close to the deadline, I decided to revisit the onions. And that was when things got strange. The onions I had been watching for weeks were in riotous full bloom. I tasted a flower and it was a burst of sweet followed by the bright stab of scallion. But the flowers were held above that bulbous head by thin stalks that curled and twisted, and they weren’t coming from those pearls. They were coming from between them. So, the pearls weren’t seeds resulting from sexual reproduction, those tiny, tasty flowers were taking care of that. And yet the plant still produced all these tightly packed things. Why? Turns out, the pearls are bulbils, tiny bulbs, each one a clone of the parent. This is a real belt and suspenders approach to reproduction and not the rule among onions. Most onions pick either one or the other approach. 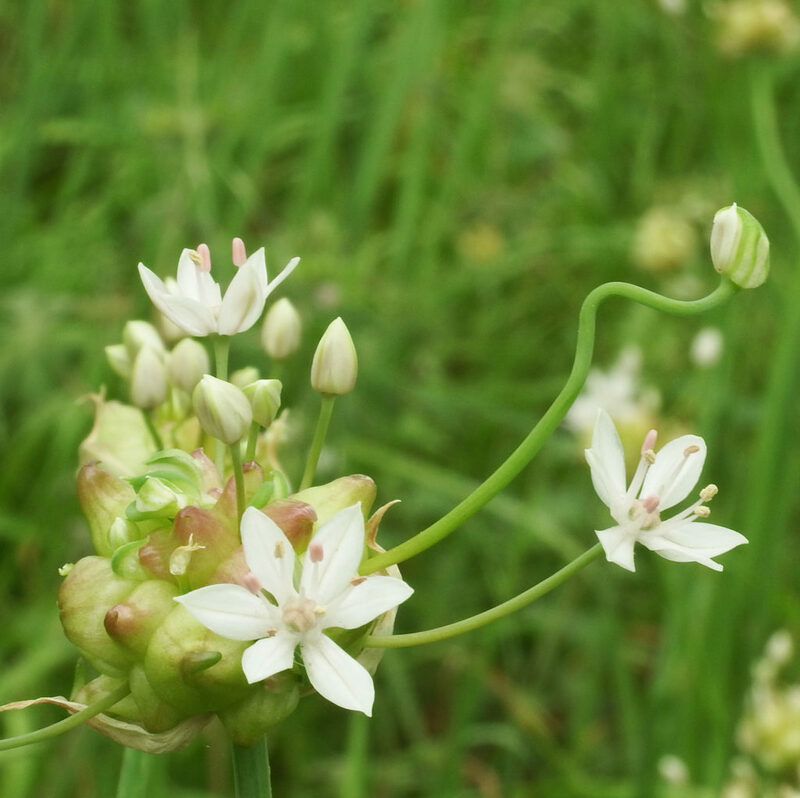 Egyptian walking onions produce heavy bulbils that eventually pull the “flower” head to the ground where the bulbils send down roots and start the process over again. 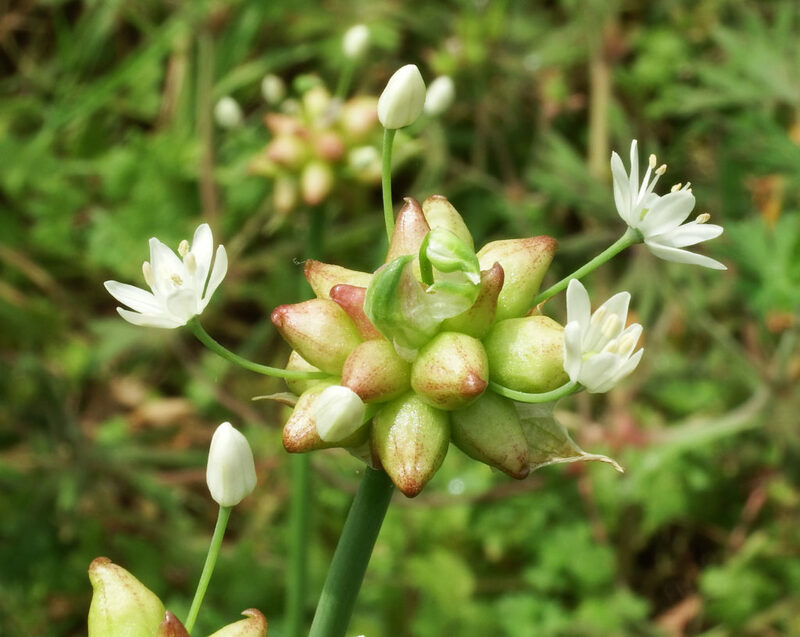 Other onions (onions we have right here in the Park) use those pearls to unfurl tiny green scapes each of which will be topped by a normal flower. But the wild onions just west of the McGovern Cascade leave nothing to chance. They have sent up flowers to make seeds and they have produced bulbils so if all else fails, the plant can try again next year as a clone. In the photo below, you can see one of the bulbils starting to sprout. By the way – these plants are very edible and when you find them someplace other than the Park, you can collect them for cooking. But if you do, please be very, very careful. There are two lookalikes one of which will send you to the hospital. The trick to telling onions from their dangerous impostors is easy. Use your nose. If it smells like an onion, it’s an onion. So smell each plant you collect. Don’t assume that just because it’s in the middle of a field of onions, that it, too is an onion. Smell each plant. And enjoy. Now as to my mistaken assumptions. It’s time for the cliff swallows to return to the Park, so I went hunting for them last week. Their colony is under the Waugh Drive bat bridge and last year they rebuilt after Harvey. I went to the colony and it was empty and in disrepair. I got worried and went further and when I got to the Studemont bridge, I found swallows swooping everywhere. 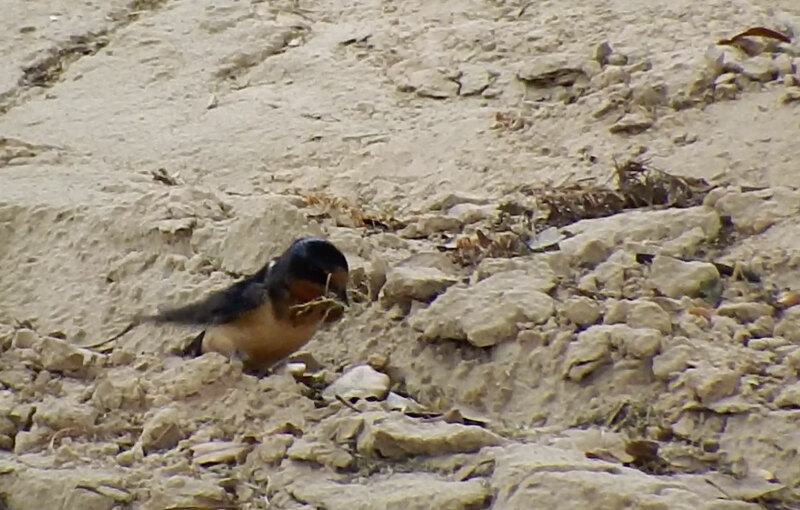 Assuming these were the cliff swallows setting p a new colony, I filmed a few gathering what looked to be dead grass and took note because I had previously seen them collect only mud. 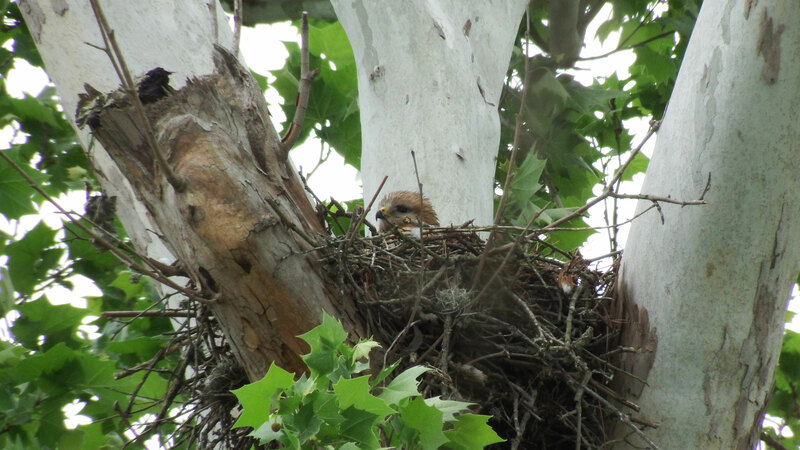 The second mistake is that when I did my routine check on our red-shouldered hawk nest. The nest has been empty every time I checked, so I didn’t wait even a minute when a quick look showed an empty nest yet again. Riding home on the other side of the bayou, I stopped to look at the nest from a different angle and low and behold, there she was, sitting on eggs. I set up a camera and waited. She surprised me by leaving the nest for 10 minutes, but she was kind enough to call loudly before returning so I was ready with the camera to catch her return. More about her next week and more about how to find her nest. No need to rush. She will be sitting on her eggs for about a month.